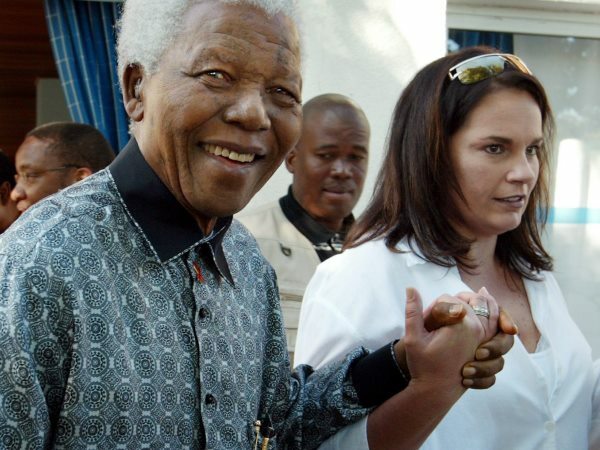 Nelson Mandela has bequeathed R50 000 each to a number of personal staff, including Zelda la Grange, in his will that was read out in Johannesburg on Monday. Nelson Mandela is assisted by personal assistant Zelda le Grange as he leaves the polling station after casting his vote in South Africa's third democratic general elections in Johannesburg. He also left money to a number of schools and organisations. Other beneficiaries listed in the will that was read by Deputy Chief Justice Dikgang Moseneke included his children, grandchildren and great grandchildren. His wife Graca Machel has 90 days to decide whether she will waiver her right to half of his estate, Deputy Chief Justice Dikgang Moseneke said on Monday. "The marriage between former president Mandela and Mrs Machel was in community of property," he said while reading Mandela's will out in Johannesburg. Moseneke explained that when a couple was married in community of property they were entitled to 50 percent of the estate if one of the partner's die. "She may opt to have exactly half of the estate. It's an election that needs to happen in 90 days... that's still pending." The provisional assessment of Mandela's estate was about R46-million.